Nature’s Sunshine Lymphatic Drainage contains nutrients to aid the proper dispersion of lymphatic fluid. The lymphatic system helps keep the body healthy by removing waste from cellular metabolism. Nature’s Sunshine Lymphatic drainage aids this process for a better well-being. 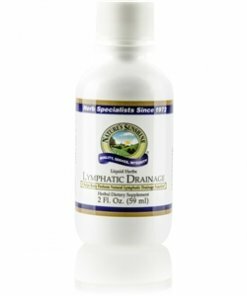 Lymphatic Drainage contains cleavers, red clover, stillingia root, and prickly ash bark. A natural and pure extract composed of the finest cleavers aerial parts (Galium aparine), red clover tops (Trifolium pratense), stillingia root (Stillingia sylvatica), and prickly ash bark (Zanthoxylum americanum) in vegetable glycerin.